Carol Crandall said running the Boston Marathon might have been the hardest thing she’s ever done. Crandall said running Boston wasn’t on her radar until a few years ago. 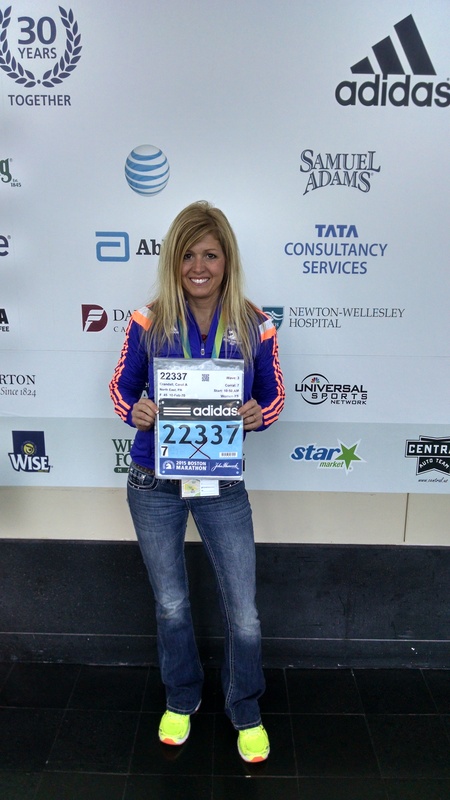 Three years after those initial I-want-to-run-Boston pangs surfaced, Crandall qualified. But running the marathon would prove much harder than qualifying. One month before the marathon, her ankle swelled up like a softball. “I’d been battling plantar fasciitis and bone spurs for a year in my left foot,” she explained. Her battle landed her appointments with sports medicine doctors and physical therapists. She did water therapy, ultrasound, stretching, strengthening. She tried compound medicines, an air heel, heel lift, and she cut out hill training –all to no avail. Then she suffered her ankle injury. Carol Crandall at the Boston Marathon packet pick up–still not quite sure she can finish. Her dreams of running a PR (personal record) at Boston became dreams of finishing at all. She felt her hard work slipping away. Crandall had mustered through a brutal 2015 winter. She lives in North East, Pennsylvania–just east of Erie, Pennsylvania which is known for it’s record snowfall. Her long runs had been done on a 13-mile loop at Erie’s Presque Isle State Park–a peninsula jutting out into a cold Lake Erie. She’d weathered the ice, snow and bone-chilling lake winds to train. Sometimes, when the park was impassable, she’d run 15 or 20 laps with a few running buddies around the only place she could find plowed–a local mall parking lot. Now her ankle injury would have had her believing it had all been for nothing–except for the words from a friend. “Under the suggestion of my friend and mentor, Mike Vieyra, I cautiously eased back into running for the last week before the race–building up to six miles,” she said. Then she asked for prayers. Crandall is a true believer in the power of prayer. She’s a prayer keeper. She keeps her friends’ prayer list close to her heart at all times. Some runners believe her prayers are answered before others. But this time, it was Carol who needed the prayers–and they came. Prayers and running have gotten Crandall through more than Boston. She said the same combo helped her deal with her father’s illness and death. Crandall said running was her coping mechanism. 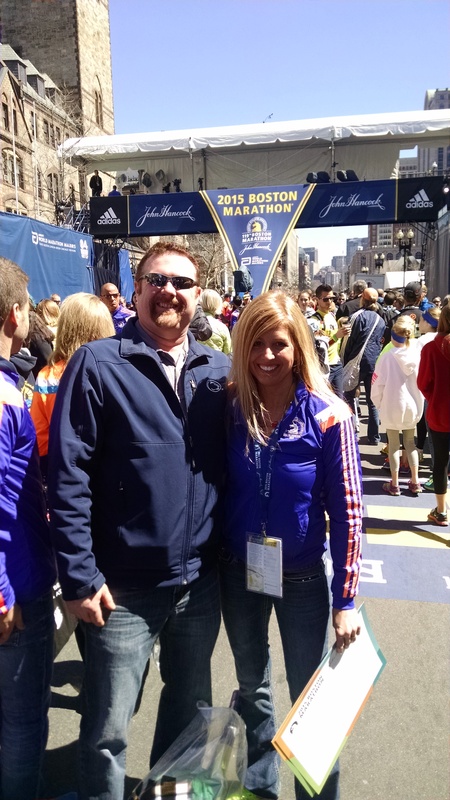 Crandall continued running marathons after that first one dedicated to her dad, and her times lowered enough to qualify her for the 2015 Boston Marathon. For her, running Boston was an unbelievable experience. Crandall said 26.2 miles of cheering in the rain was humbling. “I felt like an Olympian.” Bostonians welcomed her and the other runners from the time they arrived until the time they departed the city. “People stopped me on subways, in elevators, even out of a parking garage to ask if I was running on Monday and to wish me luck,” she said. There wasn’t any time during the race that she couldn’t hear the cheering crowds. 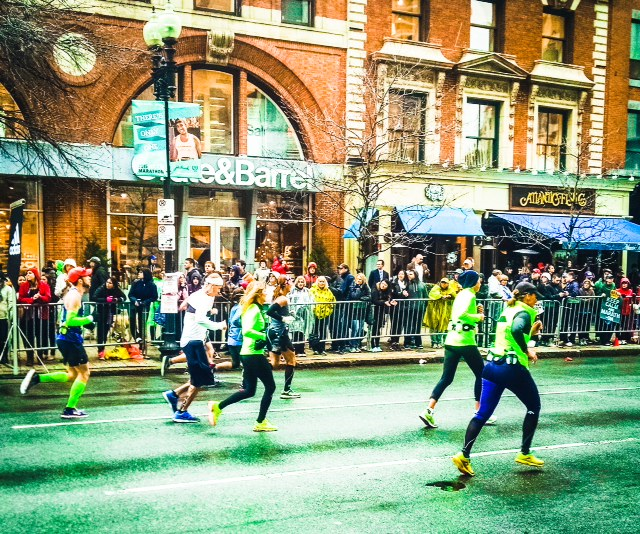 From Hopkinton to Bolyston Street, they roared. Despite the devastation, she said Boston’s spirit had remained unscathed. Running isn’t merely exercise to Crandall; it’s a part of her. And she feels fortunate to have a family that supports her. Married to the Penn State Behrend Campus Foreman of Maintenance and Operations and a race-car driver, Brent Crandall, for over 26 years, Carol said Brent waited for her in Boston’s cold and rain for three and a half hours–never complaining and overjoyed when she crossed the finish line. Crandall believes running has allowed her to relay a healthy lifestyle to her family and to show her children that you can achieve anything if you’re willing to work for it. So Carol runs with others. Athletchic feels blessed to call Carol Crandall their friend and honored to interview her. She is truly beautiful inside and out! Congratulations and run on, Boston Marathoner Carol Crandall, run on! Carol at the finish line with Husband Brent holding his sign. 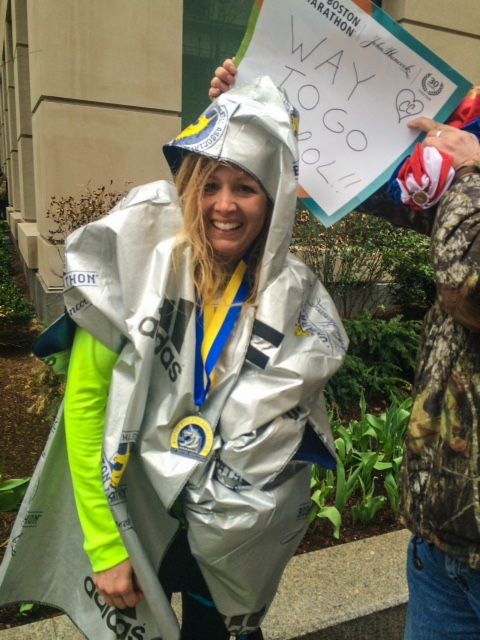 Cyndie Zahner is a freelance writer and has completed the Boston Marathon twice. She found the Bostonians as gracious as Carol did and loves it just as much. Follow Cyndie on Twitter @tweetyz and on Instgram at athletchicz. Awesome article about an Awesome woman!